Mudunkotuwa West, village in the Ratnapura district has become a role model in the IT skills development and the use of IT to integrate the village development and livelihoods of the people with the markets. The youth camp held on March 7-8 at the village showcased these achievements of the village especially the IT skills achieved by the village youth. The youth camp where 68 people from 19 villages participated was organised by the ITshed society of the village. The ITshed commercial web portal of Gemidiriya is the business link of the Gemidiriya villages with the markets. The web provides supply and demand information of the Gemidiriya village and links the producers with the markets. It provides up to 500 web pages for a village which some of the techno savvy village youth use creatively to give various information of the village. Sanath Mudunkotuwa, a young artist who engage in making murals has his own web page in the ITshed web portal. The village company gives the details of products, services and skilled labour available in the village. The first day of the youth camp covered IT skills development, including designing of web pages and learning how to use the technology effectively link the village IT centres with relevant institutions. After the theoretical session, they designed their own web pages and published on the web. On the second day they learnt about the green productivity and 5S concepts and practically implemented the concepts in the selected households and the village. They arranged houses according to 5S concepts and launched green productivity initiative to the village. They collected a lorry load of recyclable waste materials from the households and sold them to a private company in Colombo. On the third day they learnt lessons on how to deal with media in the development process including training on preparation of radio and TV programs. The camp ended with a cultural event. In the youth camp they have optimally used IT and communication resources the village had acquired from Gemidiriya , the resource people who participated live far away thanks to technologyThe Gemidiriya CEO, Dr. Gamini Batuvitage regularly participated at live discussions through Skype and all these technical preparations were done by the village youth. Explaining the IT skills development of the people in Mudunkotuwa West village, the technical consultant of the ITshed Commercial Web portal, Ven. Mahinda Thera said, "there was a Nenasala IT centre in the Mudunkotuwa village initiated by the Gemidiriya project. It had physical resources but there was a lack of human capabilities and the centre was under utilised. We supported in capacity building and at first we trained one youth giving instructions through telephone. Then they learnt to use Skype facility, chatting, web page designing, office packages, desk-top publishing and got information related to their needs. After that they started to use their knowledge and resources in a more innovative manner and today they have integrated the IT with their village development activities. Their achievements are impressive", he said. Minister of Samurdhi Development Pavitra Vanniarachchi was the chief guest at the youth camp and she was impressed by the IT skills of the youth. Addressing the participants she said that none of the rural development projects in Sri Lanka is successful as Gemidiriya in the capacity building of the people. As the political leader of the area who persuade to get Gemidiriya to Ratnapura district I am happy to see the development in Gemidiriya villages, she said. Mudunkotuwa West is a small village with around 250 families situated in Kiriella in the Ratnapura district. The main livelihood of the people is agriculture, mainly tea smallholdings and the village was isolated due to dilapidated village roads. Under Gemidiriya, the villagers have constructed access roads to the village by laying concrete. The village youth have used skills development fund to follow various technical courses, including computer courses and some of them have already completed these courses and are employed. Today Mudunkotuwa West has become a model village not only for Gemidiriya but also for similar foreign rural development programs. Several foreign delegations have shared Mudunkotuwa experience and last week a delegation from Afghanistan visited Mudunkotuwa. Naoko Ishii the World Bank Country Director of Sri Lanka recently visited Mudunkotuwa West and witnessed the development goals achieved by this courageous people under the Gemidiriya project. Gemidiriya is a World Bank funded project. Virtusa Corporation (NASDAQ: VRTU), facilitated setting up IT laboratories for fifty rural schools in the Uva province partnering as a part of Virtusa's CSR initiative "Digital Reach". The program is carried out in partnership with Uva Wellassa University. This is aligned with Virtusa's sustainable strategic plan and the Uva Wellassa social responsibility program. The goal is to empower communities by creating avenues that strengthen capabilities in education and employment through access to information and communication technology (ICT). This enables societies to improve standards of living. The company provides schools with computer laboratories as well as necessary text books and material. General Manager - Sri Lanka Madu Ratnayake said, "Access to computers and ICT in general has a tremendous potential to empower rural youth to become an active participants in the global knowledge society. We are happy to make a contribution towards empowering rural Sri Lankan youth with ICT. With the strong support from Uva Wellassa University, we hope that this initiative will open doors for many students now and years to come." Vice Chancellor of the Uva Wellassa University Chandra Embuldeniya said "This is an impressive social responsibility act on part of Virtusa and the Uva Wellassa University. Uva is a province where the majority of the families are living in impoverished conditions. The project is an opportunity to enrich our community to experience IT education by providing access to higher educational paths. We have looked into the sustainability of the project in selecting the correct schools, in terms of school infrastructure, resources and security. And we are armed with a committed set of lecturers and IT students. The Uva Education authority extended their cooperation to make this program by selecting the broad category of schools and communicating with them. Intel Corporation has extended its lead in the high-end server segment, setting new standards in virtualisation performance with the launch of seven 45 nanometer (nm)-manufactured Intel (Xeon) Processor 7400 Series products. With up to six processing cores per chip and 16MB of shared cache memory, applications built for virtualised environments and data demanding workloads, such as databases, business intelligence, enterprise resource planning and server consolidation, experience dramatic performance increases of almost 50 per cent in some cases. Platforms based on these processors can scale up to 16 processor "sockets" to deliver servers with up to 96 processing cores inside, offering tremendous scalability, ample computing threads, extensive memory resources and uncompromising reliability for enterprise data centers. This new processor series helps IT manage increasingly complex enterprise server environments, providing a great opportunity to boost the scalable performance of multi-threaded applications. IFS, the global enterprise applications company, launched its eco-footprint management tool to provide organisations with unprecedented control and transparency on the environmental impact of their operations. The tool offers customers for the first time an enterprise standard methodology to help them control costs and meet an urgent need to prepare for compliance with environmental legislation. Eco-footprint management will be added to IFS's software suite, IFS applications. Users will be able to configure IFS applications to capture environmental impact information from throughout their business just as easily as they configure their financial system to capture cost. IFS customers will be able to track the impact of a broad spectrum of activities ranging from raw material sourcing to product design to logistics and emissions - helping them analyse their operations, learn environmental patterns and plan for urgent legislative requirements. "Existing components within IFS applications that capture financial cost will now be able to monitor carbon dioxide, lead, sulphur and other environmental impacts as an additional cost," said IFS Vice President Product and Marketing Thomas Petersson. "For example, users will be able to assign different carbon footprints to various methods of transport helping them see the environmental as well as financial cost of shipping materials by train versus truck, and compare the carbon footprint of local versus offshore sourcing." The new application will support IFS customers around the globe who are under increasing pressure to comply with upcoming environmental legislations such as Europe's EuP Directive, the Environmental Liability Directive and the EU restriction, evaluation, and authorisation of chemicals (REACH) regulation as well as Australia's National Greenhouse and Energy Reporting Regulation and the US Climate Action Partnership's recently proposed `Blueprint for Legislative Action' against climate change. PEO TV, the first Internet Protocol Television Service (IPTV) in Sri Lanka launched its PEO Street TV promotion recently beaming a wide range of entertainment options on a daily basis from 6.30 pm to 11.00 pm to the public. This has been a huge success thus far, attracting people from all walks of life, showcasing an all in one entertainment solution on a large screen from its strategically located SLT VisionCom office at 60, Davidson Road, Colombo 4. One can now experience an out of the box Personalized Entertainment Option, featuring 43 channels on all genres, such as entertainment for adults and kids, business, education, news and sports in addition to free-to-air local television stations, which includes Rupavahini, Channel Eye, ITN, Derana and Max TV. 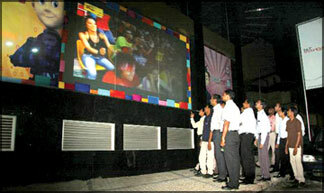 Speaking on the significance of the PEO Street TV, CEO, SLT VisionCom (Pvt) Ltd. Thusha Weerasooriya said. "Our aim is to attract the attention of the public that walks past our head office, and arouse their curiosity, encouraging them to walk into our modern showroom and have the unique opportunity of experiencing interactive television. Our PEO Street TV promotion, which is currently in progress has been a huge success, with a cross section of society having already visited the showroom." They were able to watch and experience how IPTV works as well as how to use the features such as Video on Demand (VoD), Trick Play Functionality, Time Shift TV and other special features that the future of entertainment offers. A popular feature of the PEO Street TV promotion is the Time Shift TV, where a wide variety of programs, including the recently concluded cricket tournament between Sri Lanka and India was beamed, giving those who have missed, the opportunity to watch it. Time Shift TV gives greater flexibility to the viewer, allowing them to watch any programme at a time convenient to them. PEO TV is available at the SLT VisionCom head office well as all 16 selected SLT Teleshops and 12 Regional Telecom Offices in the covered areas of the initial stage of expansion. It covers all major areas of Greater Colombo with the inclusion of Kalutara, Kurunegala, Kandy and Katunayake. Further services will be made available in Gampaha, Negombo, Galle, Matara, Avissawella and Ratnapura during the early part of 2009.